The beauty of Cape Cod shows up in many places with family attractions and activities both natural and manmade. Scenic ocean beaches, quiet marshlands and wildlife sanctuaries are there for sightseeing, playing and relaxing. Nearby busy streets in quaint villages are filled with galleries and museums, shops, cafés and restaurants. Enjoy exploring your very own piece of the Cape on foot, by bike, car or trolley. Whether a day, a week or longer, you will never run out of magical things to do. Getting there is more than part of the fun. 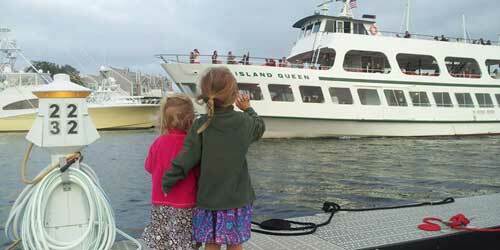 For more than 50 years, the Island Queen has been a special part of the journey to beautiful Martha’s Vineyard. Sailing out of Falmouth, MA on Cape Cod to Oak Bluffs on the Vineyard is a perfect way to spend a delicious 35 minutes on scenic Vineyard Sound. Park your car in the secure lot and climb aboard with your bicycle, kayak, paddle board and pet. Sit back and relax, read, and chat up a new friend while enjoying the sun, sky and salt air. The Island Queen runs the sea along the historic Massachusetts Coast from May through October. Reservations are not accepted. Group Bookings available for 20 or more passengers. This national park offers a full summer’s worth of fun for people of all ages. 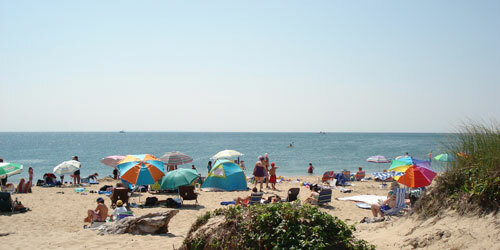 Six ocean beaches (lifeguarded) offer play in the surf; there are many walking and biking paths through inlands dunes, woodlands, and around cranberry bogs and small freshwater “kettle” ponds. Explore the first lighthouses in the country (commissioned by President George Washington). Historic sites, like the place where the first trans-Atlantic telegraph was sent.